A group of environmental organizations sued the US Forest Service on Tuesday, claiming that it allowed Nestlé to illegally divert millions of gallons of water from California’s San Bernadino National Forest to use for Arrowhead brand bottled water while the state struggles through a historic drought. Nestlé has had rights to bottle water from the forest’s Strawberry Creek for decades, but a Desert Sun investigation in March of this year found that the company’s permit to use a four-mile pipeline that transports the water to the bottling plant expired in 1988. A month later, the agency announced it was investigating the permit. 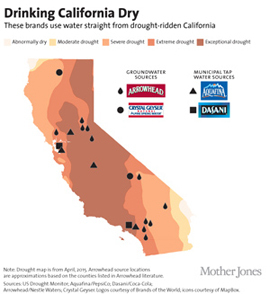 Other popular bottled water brands like Aquafina and Dasani also source from catastrophically dry regions. The plaintiffs—the Center for Biological Diversity, the Story of Stuff Project, and the Courage Campaign Institute—are calling on the Forest Service to shut down use of the pipeline and conduct an environmental review immediately. They contend that the Forest Service is breaking its own policies by allowing the bottling operation to continue, as the siphoning of water from the already depleted water source is harming local habitats and wildlife.